Discussion in 'Tarantula Questions & Discussions' started by Cobalt_Rachel, Oct 8, 2007. First thing that comes to mind is a mature male. Is she blue? Can you get a picture? If she isn't a mature male, then as long as her abdomen isn't shriveled or small she should be fine. I don't wanna say premolt since you say shes out alot and moving, but just make sure you keep a full waterdish in her tank. Would help to know the approx size..
Just based off that picture I am going to say it's way to dry. A liberal soaking of the substrate would be better then a misting. In between soakings allow the substrate to dry out some as well before soaking it again. She looks fat enough. And from the picture it does not look like a MM. How big is she? Nope definately not a mature male, but it is too dry in there. Like Ryan said, I too do the soakings every couple of weeks. Moisten up the substrate by just simply pouring water on all surface levels of the substrate. Usually when a female wanders around her cage, it means shes unhappy or hungry(but you says shes not eating so this could be ruled out). How can you tell the different of a mature male or not from the photo? Because mature male lividums aren't blue.. here's a picture of a mature male. Man, if mine turns out to be a male, I'm going to be flat out pissed. lol Are they at least blue during their juvi stages and such or not at all?? My sling has taints of blue on his/her leg, and has markings on her rear. Also has little brown hairs. 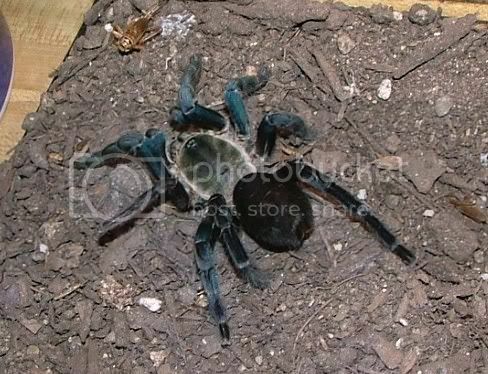 Males are blue until their maturing molt. So you will atleast enjoy some blue if it does turn out male..
thanks guys. i'd say she's about 2 and a half to three, by four or so inches. But i've never been awesome at guessing measurements haha. Oasis is just finishing up her cricket. thanks for everyone's help! Haha, wow. It's good to hear she's eating again! Just to be a worry wart I have to ask you how deep the substrate is, because that particular substrate you are using does not seem suitable at all to me, for a cobalt blue not being able to be in a whole their hole life (hehe) will definately die. Ah, you bring up a good point! I didn't notice at first, but the substrate really doesn't look deep at all. Rachel how deep is the substrate? it's eight inches deep. when i got her they never said anything about it, but i was reading later and it said to make it 8 inches deep. So, i did. I dont want her to fall! that would be horrible! One thing I'd like to mention is that if she is out more, that is a sure sign of abnormal H. lividum stress syndrome (hehe) What kind of burrows has she developed (if any?) since you got her? Everything will be all good and fine with you cobalt blue if you haven't seen her shadow in the past 6 weeks. I also think that even though they need deep substrate for burrowing, I don't think the species will readily climb glass cage walls, unless stressed..
Good, but it's not just about her falling, this species is an obliagte burrower. They need room to burrow to live stress-free and happy lives.